UD Quon have released an 8-litre variant. 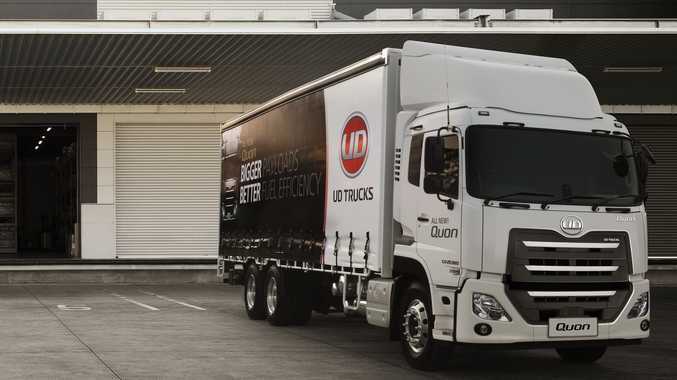 ON THE back of the success of the New Quon, launched in 2017, UD Trucks Australia is announcing a new 8-litre variant ahead of the 2019 Brisbane Truck Show. The new addition to the Quon range comes with a great lineage with the 11-litre Quon deemed "best-specified Japanese truck" in the Australian media. The 8-litre Quon will come in two models, the CD 25 360 and the CW 25 360, with the former being the showcase piece on UD's stand at the Brisbane Truck Show in May. The new addition features a GH 8 engine, boasting a maximum output of 263 kW/2200 rpm, with a maximum torque of 1428 Nm/1200 - 1600 rpm. The 8-litre engine means that 300 kilograms has been stripped from the original 11-litre models, allowing for greater load efficiency. The Quon redefined the heavy-duty Japanese truck market in Australia and the 8-litre version delivers the same great features and the same ultimate dependability as the 11-litre. It's been built to excel in the tough Australian conditions and delivers improved uptime thanks to features such as disc brakes, enhanced service intervals and support from Volvo Group's extensive service network. UD Trucks has also designed the 8-litre Quon with a host of advanced safety features to ensure the safety of the driver and other road users. This includes: Traffic Eye Brake, UD Stability Control, and Lane Departure Warning System. As well as safety, UD Trucks values environmental care, and the 8-litre Quon delivers a number of features which work together to maximise fuel savings, including ECO mode, adaptive cruise control, and ESCOT Roll. UD Trucks Australia Vice President of Sales, Mark Strambi, hails the truck and its features, believing it to be a valuable addition to the UD range. "The 8-litre version is an exciting addition to the Quon range that offers the same levels of drivability and safety as the 11-litre version," said Mr Strambi. "It really is a fantastic truck. Slightly smaller than the 11-litre models, it still possesses a sizeable payload, while offering operators extra flexibility through a greater load efficiency." On a recent trip to Japan, UD customers were given an opportunity to drive the Japanese-spec 8-litre Quon. As well as the test drive, the customers visited UD Trucks Headquarters in Ageo and were given an insight into UD's innovation roadmap and strategic plans moving forward. Mr Strambi said: "UD Trucks strives to implement care, pride and quality into the mindset of its workforce and how it designs and builds trucks. We wanted to highlight UD's philosophy to our customers as well as giving them an exclusive look at the 8-litre Quon," said Mr Strambi. "The response to the quality of drive and features available on 8-litre was resoundingly positive and we are really excited to be adding it to the Quon range in Australia."